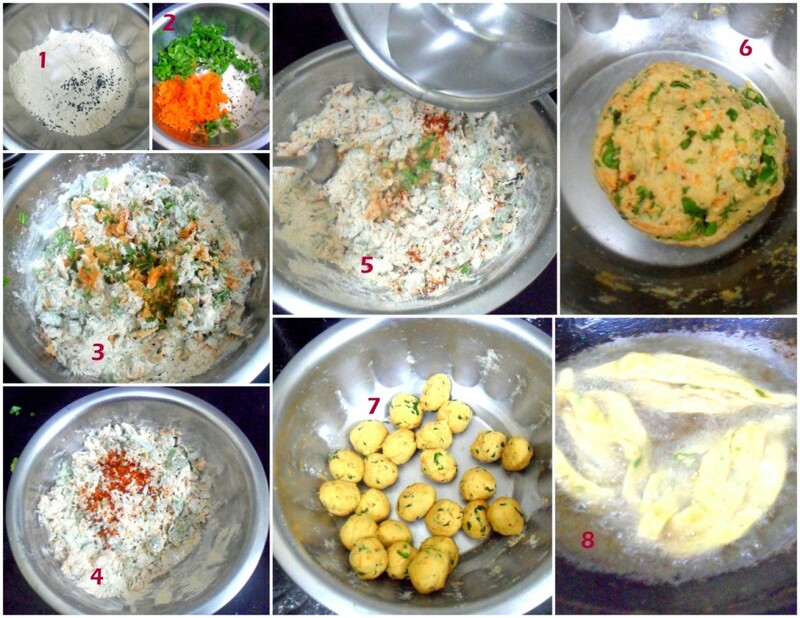 For the Indian Cooking Challenge, this month, I asked Pavani to suggest something. She wrote back saying we should try some new cuisine, especially from Assam and pointed to Sunita’s blog. I was surprised wondering how I forgot Sunita’s space, as she has some authentic Assamese dishes. 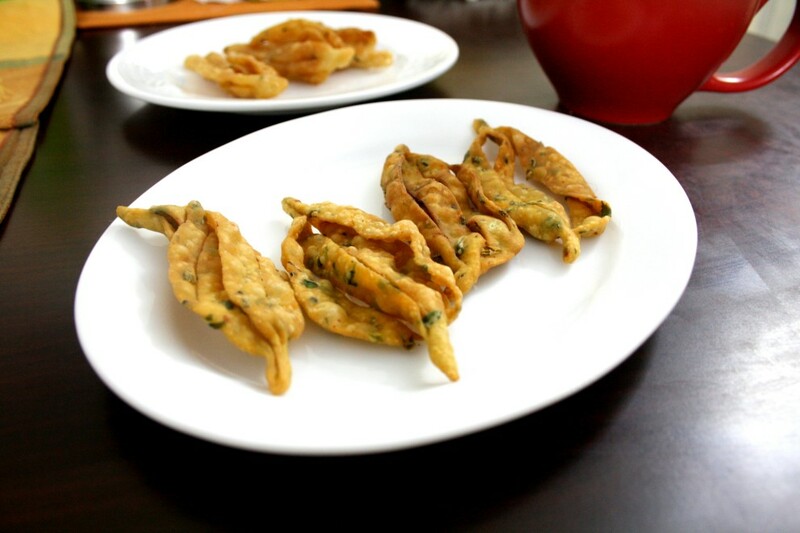 And I have been thinking I must select some Assamese Cuisine, so it was really fantastic that I was suggested this. Pavani pointed out that since most of the BM members were also part of the ICC, they might be busy and so we could do some simple gravy dishes. However on reading them I realised that it almost was how I sometimes make, of course without the Panch poran. So I searched around and ended up checking out Kordois. 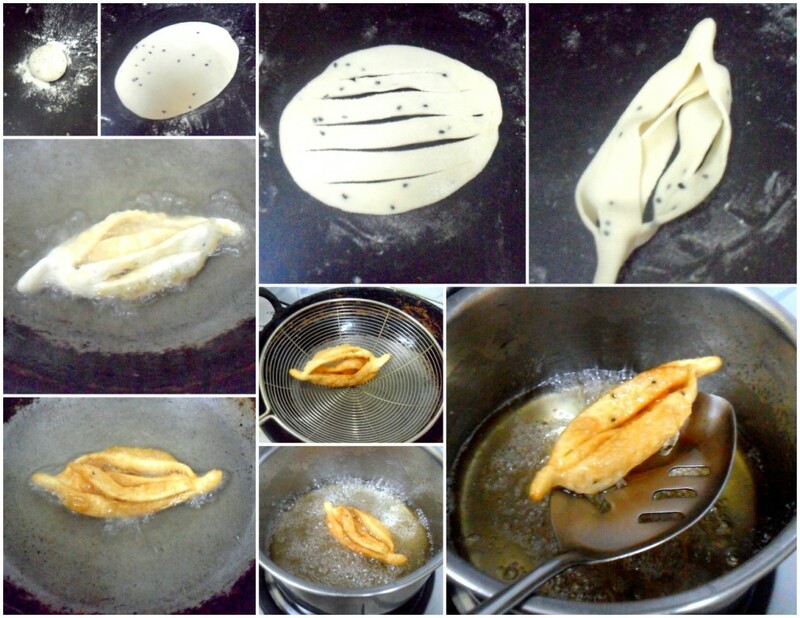 On reading about Kordois, I realised that the sweet version of Kordois is same as what we call Panasa Thonalu. Except Sunita has used Kalonji, I am sure using this would give a different taste to the final dish. She also has a savory version of this and that prompted me to select these two. So for this month, let’s make Kordois ~ both the ways. Though I had selected this much ahead and was prompt on announcing it on time, I ended up doing it just last evening and it went on till late evening as well. As Amma always says that sweet dish has to be fried first, I had to complete the sweet version and then follow on the savory. Knowing that the step by step was going to be very taxing, I called up Konda to help me. I feel so much relief these days as Konda is around to click the step by step and I need not keep washing, wiping, clicking. It has always been such a handicap and so many wet towels in the end. One of the recent development at home, as been the promotion of Konda to rolling out the chapatis and very recently she has learnt to knead the dough as well. I am so surprised that she is a pro in learning it in the first shot and is able to so such a wonderful job. So she insisted that after she takes the necessary clicks, she will make this. And she was so happy doing it. Once the sweet versions were done, meaning the rolling out was done, I called in the boys to have a look at the magic. They were so thrilled seeing how the flower gets formed. And couldn’t wait to taste it. All three were praising on how delicious the sweet ones were. They don’t remember eating it the previous times I have made Panasa thonallu. Another funny thing that Konda remarked was, when I told her that I would make something again. She replied that till date all these dishes that I make, never get made again. I said there are still so many for us to learn, so I can’t afford to make one dish so many times.. Anyway since there were so many pictures, I thought a collage would be much more neat. Please click on the picture for a better view of the steps. I added another 1/2 cup, though 1/2 of the final syrup remained. In a wide bowl, take the flour, salt, oil, nigella seeds, rub it together. Add the hot water gradually and mix with a spoon. Once it is cool enough to use your fingers, knead to form a firm, but elastic dough. Cover the dough and leave for a few minutes. Divide the dough into small marble sized portions, shape into balls and flatten them. Roll one into approximately 4 and a 1/2 inches in diameter. With a sharp knife, cut straight lines , making sure not to cut all the way through. From one end start to make a rol, pinching the ends to bind. Push the two ends of the shaped kordoi gently to plump the middle. Continue doing the same with the rest and keep them ready. 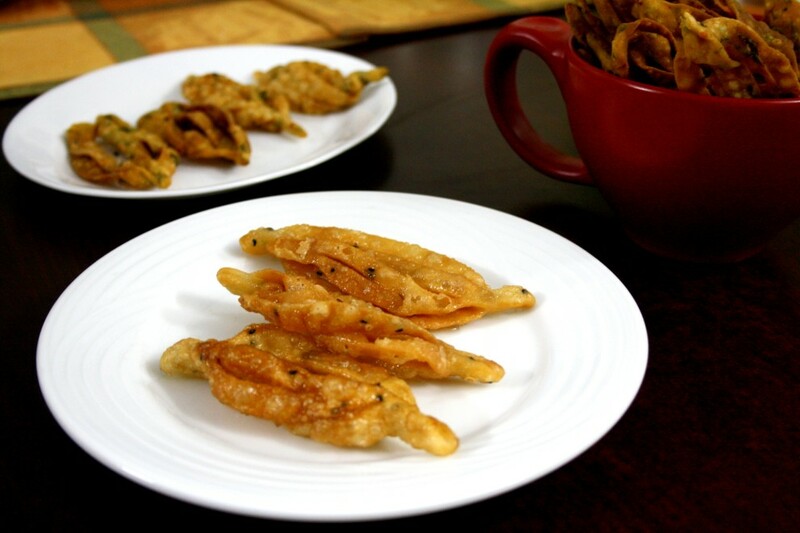 Deep fry the kordoi till crisp and place them on kitchen towels to drain the excess oil and let them cool for a few minutes. Meanwhile, make the sugar syrup by placing the sugar and water together in a thick bottomed pan over heat. Bring to a boil. The mixture will start to foam. Remove the scum if any. And again boil. The syrup is ready when a tiny bit placed between your thumb and forefinger feels quite sticky, but is not of a thread consistency. Reduce the heat to low, and gently drop the fried kordois into the syrup, one a time. Turn them over very gently, preferably with a straight spatula, to coat them in the syrup. Remove from heat. You can also remove them from the syrup and let them cool completely. The kordois will harden on cooling. When completely cold, the kordois can be stored in glass jars to keep them fresh for a few days. Wash and chop all the vegetables very finely. Rub together all the ingredients except the water. 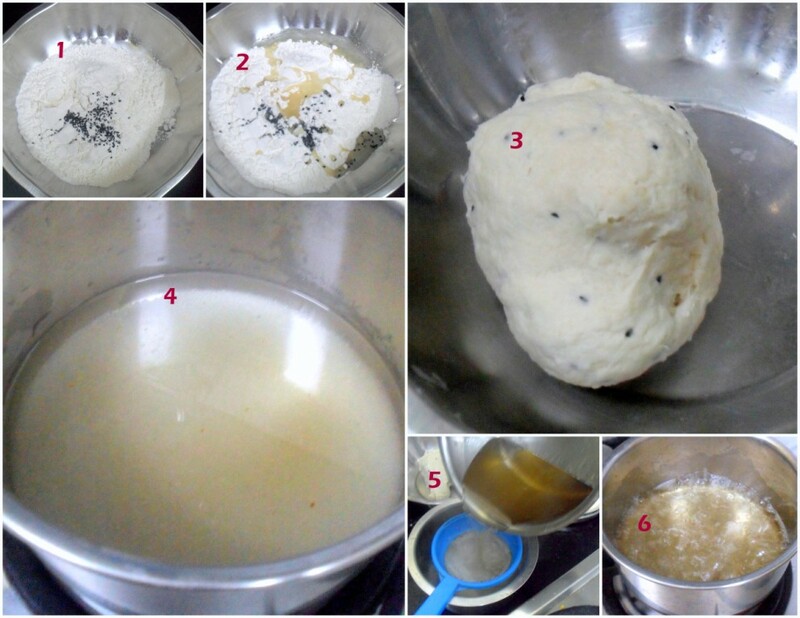 Add the water gradually and make a firm dough. Divide into smaller portions than the sweeter ones. Roll and shape like the sweet version. 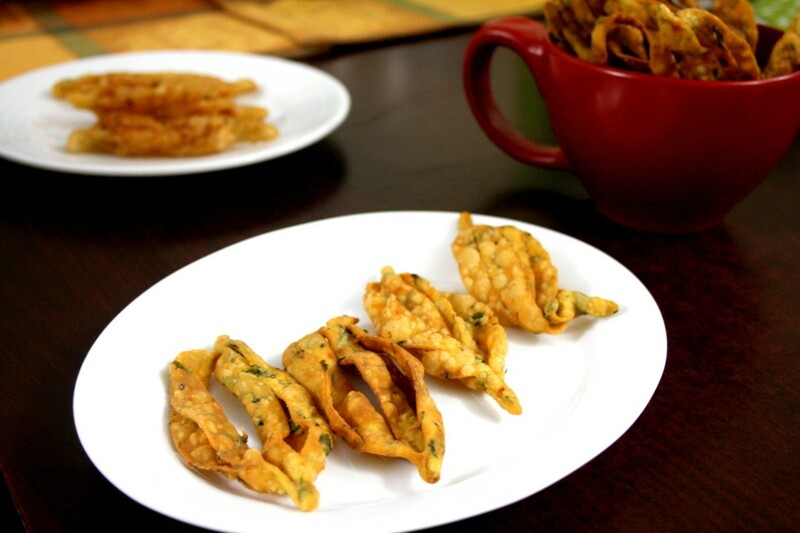 Care should be taken to ensure the extreme ends are more thinner, as they tend to get softer after being fried. 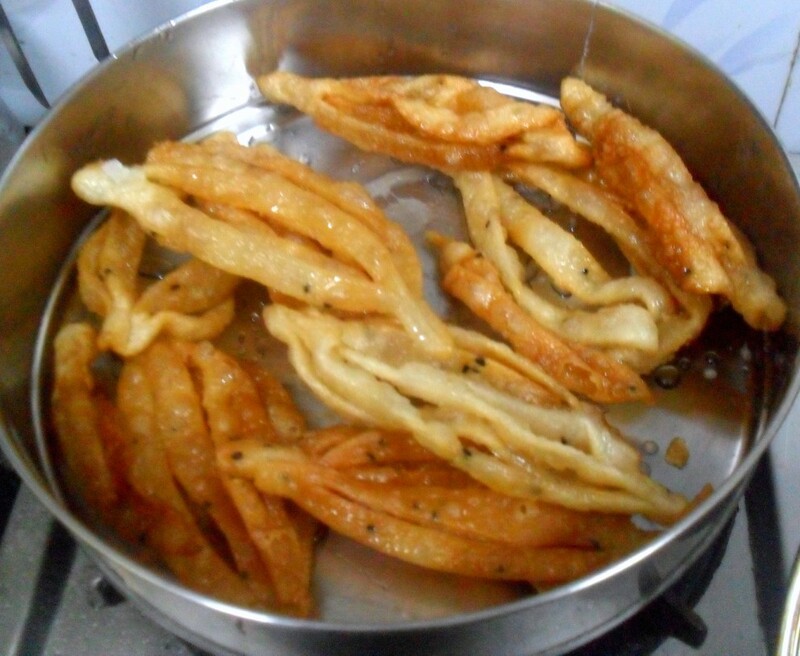 Deep fry in batches and serve hot with some ketchup/chutney. Sunita has mentioned kal jeera as Nigella Seeds. However I went ahead adding Nigella Seeds. This indeed gave a wonderful taste. Kala Jeera is Shahjeera and would taste almost similar to Cumin. And though I knew it is more possible for jeera to be added in south, I went ahead with Nigella. If you don’t have Nigella Seeds, add shahjeera or jeera. For the savory Kordois, I also used wheat flour, I dusted the balls before rolling out. Made sure the ends are shaped thinner for making them crispier. yours came out great. I just finished making the sweet ones about 1/2 hr. ago. my shapes were a little funky especially with the savory ones. I got better 2nd time around with the sweet. However, it was such a yummy challenge! wow thats an delicious sweet and savory version kordios 🙂 love the shape and pattern of making these 🙂 looks so crispy !! 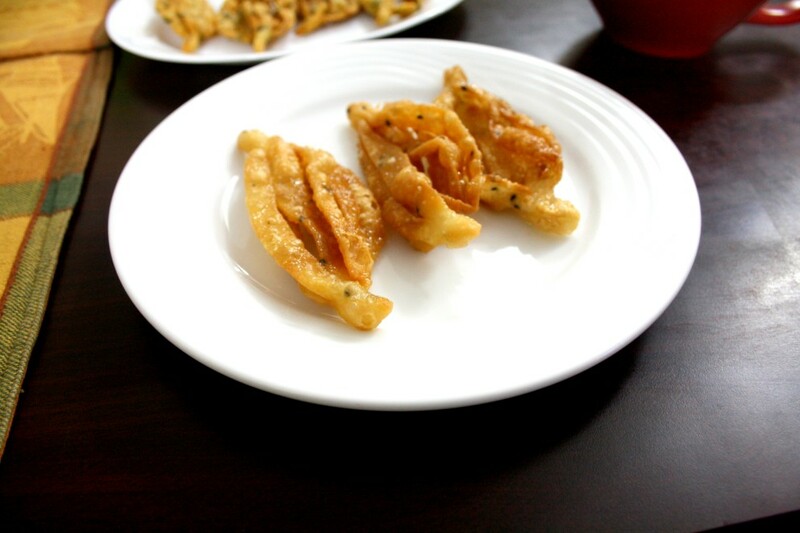 Sweet kordois are favourite now, i'll making savoury kordois soon. 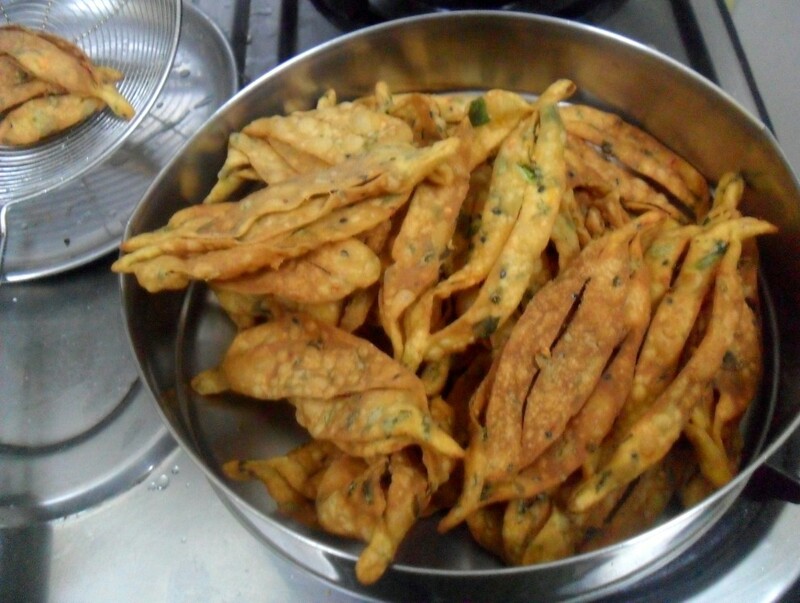 Enjoyed making these Kordois Valli. Savory version was different and tasted yummy. Loved this challenge Srivalli. Thanks to my kids I made this twice within a week and they still want more.And as you rightly said we don;t repeat dishes that often! 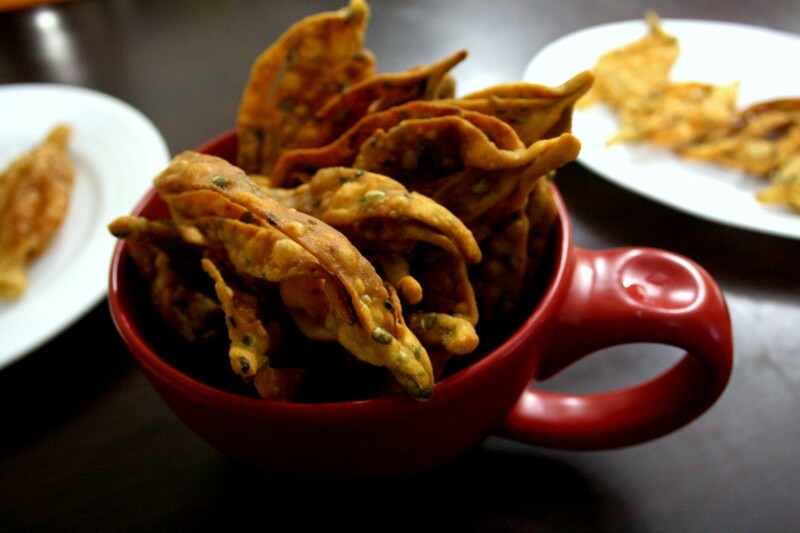 we make a similar snack named khaja ..both sweet and savoury..bt spinach and carrot is completely new twist to me.. Hearing the names first time.But seeing the nice pictures,I feel both versions should be tasty.